Pro Modelbuilders have been in business for more than 35 years and are professional, quality builders and fabricators of aerospace models. With all this experience, we know which questions to ask to help you get exactly what you require. 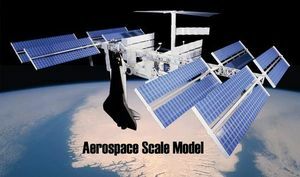 Pro Modelbuilders were commissioned by Boeing USA to augment an International Space Station model at the same scale. This shuttle is constructed of fibreglass and is displayed hanging upside down. The wings, tail and rocket array were removable for shipping. The model size is 3 meters long and the approximate weight is 180 lbs.